In this section, we're going to talk a bit about coding standards and how they relate to the theming layer in Drupal. Now the way that a theme differs from a module when it comes to code is that not only do we have logic, but we also have HTML files that include some simple PHP logic within them. And we also have CSS files. So understanding where the coding standards start and end for the theming layer can help you make some of the decisions about how you structure some of that code. When it comes to logic, which you'll see mostly in the "template dot php" file, the PHP follows all of the same conventions as PHP code for module building. So if you look at the videos on coding standards, all of those will apply. Now where things start to vary, is when we work with template files and CSS files. Ok. Let's go ahead and take a look at some of these theming specific coding standards in the context of some Drupal core code so we can see how it's being used in practice. And this is always a great way to measure what you're thinking about doing or the way that you're planning on structuring your code against some real world examples. 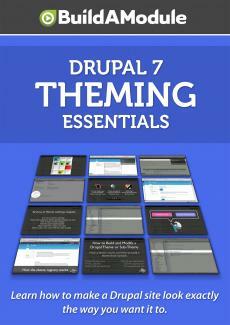 So go ahead and open up your Drupal site folder and expand the "themes" folder. And in the bartik theme, let's go ahead and open up in the template folder, the "page dot tpl dot php" file. Now this is the template file that wraps the code for a Drupal page. And scroll up to the top here. Ok.
Let's go ahead and just start at the top and look at some of the different points where there is something interesting to learn about coding standards. So at the top here you see that we have some commenting going on and this is the same structure that we use within a module context as well. And this is Doxygen style. You see there's information about this particular file and it's prefixed with and "@file" on it's own line. And it goes into the available variables for this template file. Now to find these variables without it being explicitly listed in the comments, would require putting some code inside of a preprocessing function or inside of this template file in order to render all of the variables that are available to it.